*Shipping anywhere in the world is included in the price! 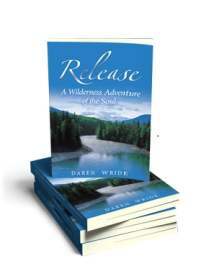 Release uses the story of a fictional two-week wilderness adventure to teach the life-planning and goal setting system developed by Daren Wride. As you read, you will notice some similarities to other teachers and speakers regarding the big issues of life, but there are some notable differences, even some ideas that are contrary to other “self-help” philosophies. And these differences are where the power and uniqueness of this process truly resides. This book is designed to help make that happen!